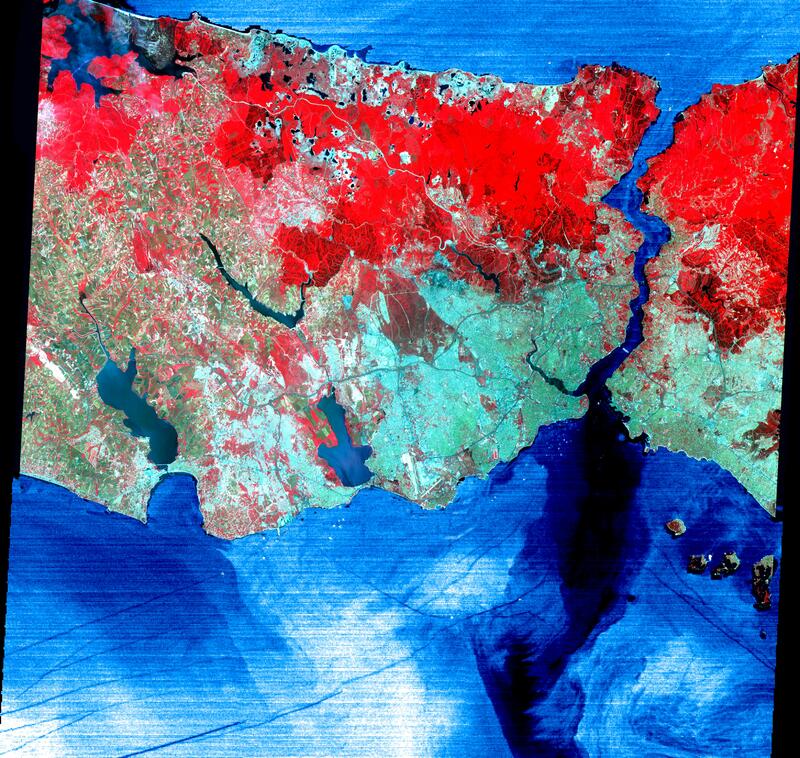 This June 16, 2000 image of Istanbul, Turkey show a full 60 by 60 km ASTER scene in the visible and infrared channels. 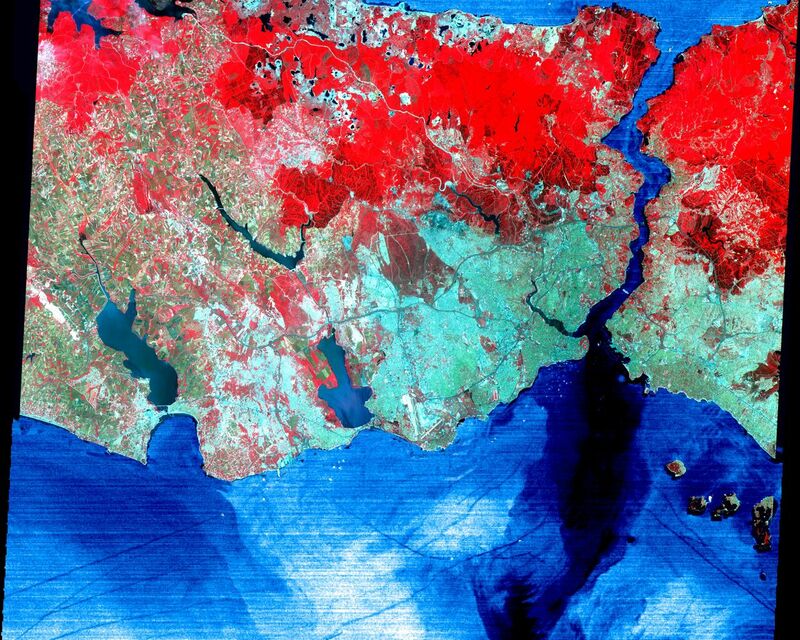 Vegetation appears red, and urban areas blue-green. Bustling Istanbul, with its magnificent historical heritage, has spanned the divide between Europe and Asia for more than 2,500 years. Originally called Byzantium, the city was founded in the 7th century BC on the Golden Horn, an arm of the narrow Bosporus (also spelled Bosphorus) Strait, which connects the Sea of Marmara to the south, with the Black Sea to the north. Constantine I made it his capital of the Eastern Roman Empire in AD 330. As Constantinople, the strategically located city arose as the preeminent cultural, religious, and political center of the Western world. It reached the height of its wealth and glory in the early 5th century. After centuries of decline, the city entered another period of tremendous growth and prosperity when, as Istanbul, it became the capital of the Turkish Ottoman Empire in 1457. Although Turkey moved its capital to Ankara in 1923, Istanbul remains the nation's largest city with a population of over 8 million, its commercial center, and a major port. Two bridges spanning the Bosporus, and ships in the busy channel can be seen on the enlargement. On the image, the water areas have been replaced with a thermal image: colder waters are displayed in dark blue, warmer areas in light blue. Note the dark lines showing boat wakes, and the cold water entering the Sea of Marmara from deeper waters of the Bosporus. Advanced Spaceborne Thermal Emission and Reflection Radiometer (ASTER) is one of five Earth-observing instruments launched December 18, 1999, on NASA's Terra satellite. The instrument was built by Japan's Ministry of International Trade and Industry. A joint U.S./Japan science team is responsible for validation and calibration of the instrument and the data products. Dr. Anne Kahle at NASA's Jet Propulsion Laboratory, Pasadena, Calif., is the U.S. Science team leader; Moshe Pniel of JPL is the project manager. ASTER is the only high resolution imaging sensor on Terra. The primary goal of the ASTER mission is to obtain high-resolution image data in 14 channels over the entire land surface, as well as black and white stereo images. With revisit time of between 4 and 16 days, ASTER will provide the capability for repeat coverage of changing areas on Earth's surface. 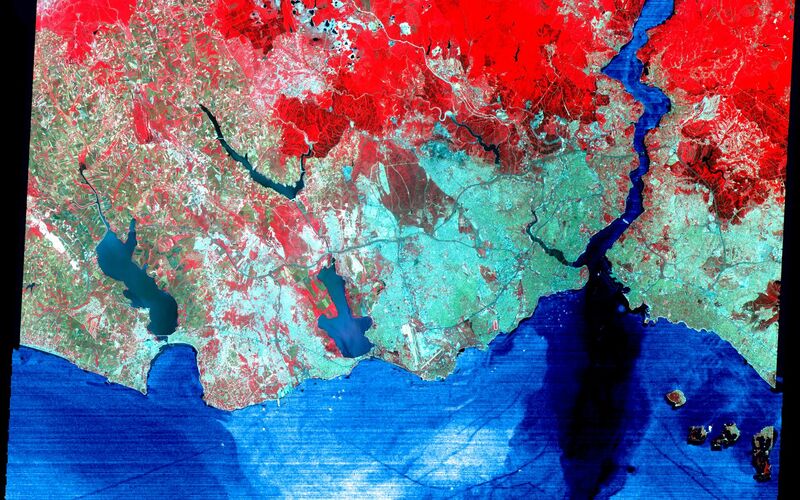 The broad spectral coverage and high spectral resolution of ASTER will provide scientists in numerous disciplines with critical information for surface mapping, and monitoring dynamic conditions and temporal change. Example applications are: monitoring glacial advances and retreats, monitoring potentially active volcanoes, identifying crop stress, determining cloud morphology and physical properties, wetlands Evaluation, thermal pollution monitoring, coral reef degradation, surface temperature mapping of soils and geology, and measuring surface heat balance.